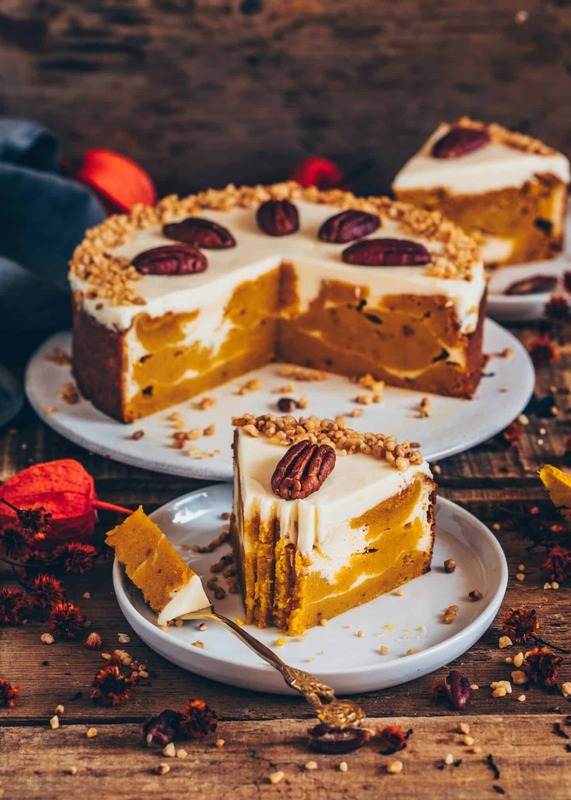 I absolutely love everything pumpkin flavored, both sweet and savory! After sharing my Vegan Pumpkin Mac and Cheese and my Vegan Pumpkin Risotto recipe on my blog, I wanted to bring a sweet pumpkin recipe now. 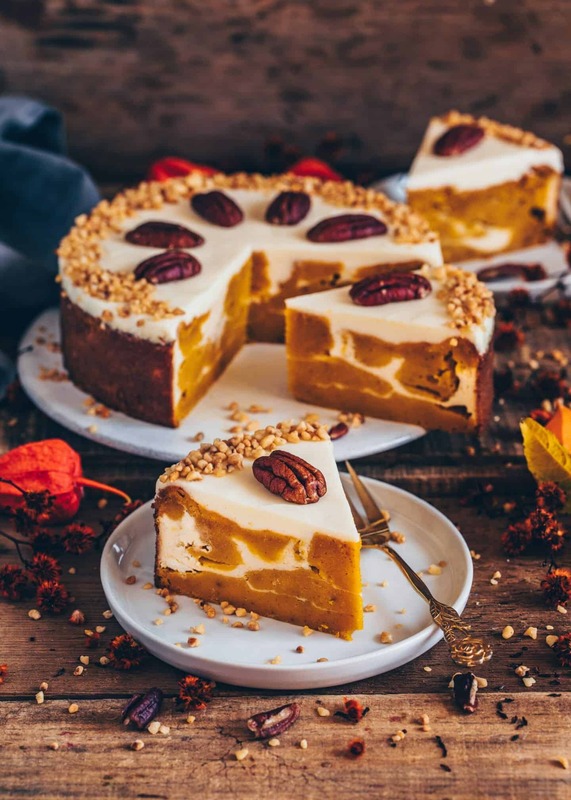 Honestly, I couldn’t decide between making a pumpkin bread, pumpkin loaf, pumpkin pie or even a pumpkin cheesecake, so I came up with the idea to create a combination. 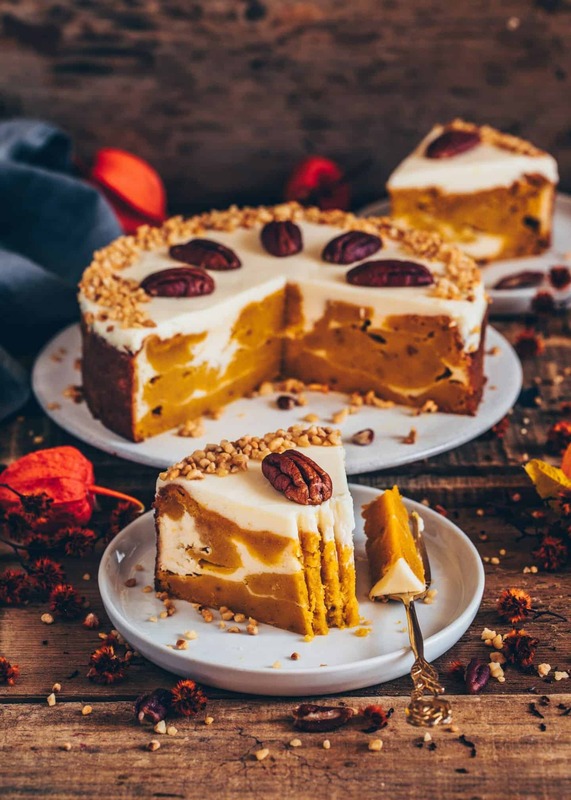 Since I love creamy cheesecakes, I thought that a moist Vegan Pumpkin Cake with Cheesecake Swirl would be amazing! 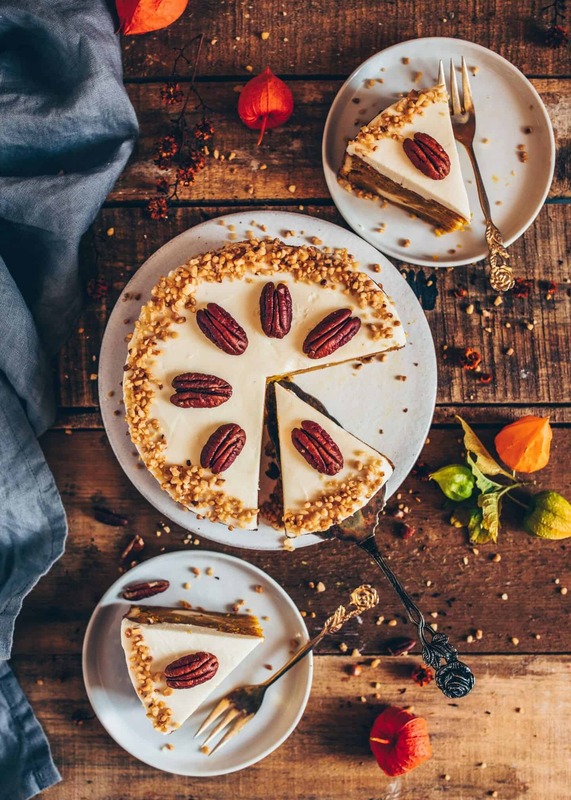 This recipe was inspired by my favorite vegan Carrot Cake. It has been quite popular with all you healthy cake lovers. I decided to make a few changes, so I swapped to pumpkin purée instead of carrots and also included a creamy vegan cheesecake marbling. 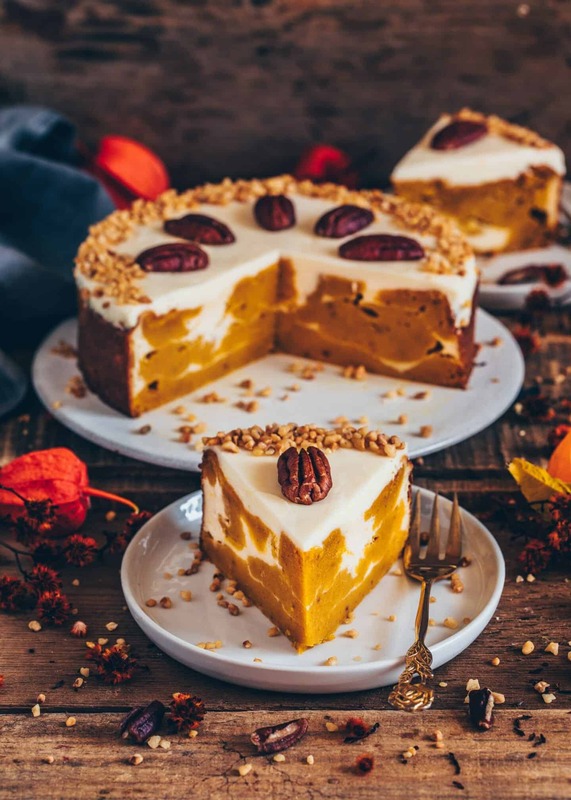 It’s deliciously spiced in the same way that a regular pumpkin bread or pumpkin pie usually is, with cinnamon, nutmeg, ginger, cloves and vanilla. It’s sweetened with brown sugar but you can sub brown erythritol to make this cake sugar-free. A Simple recipe! So easy to make! 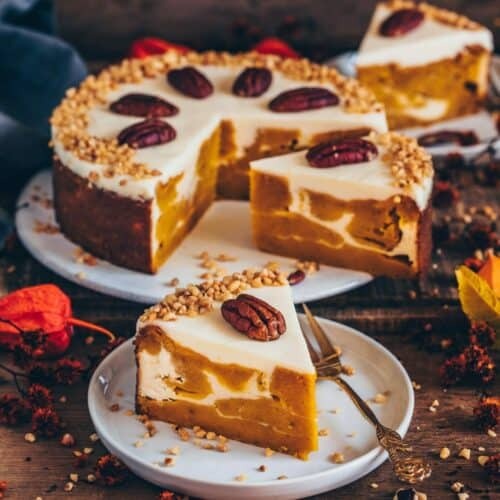 This Vegan Pumpkin Cake recipe is very easy. You need only two bowls and a few simple ingredients. 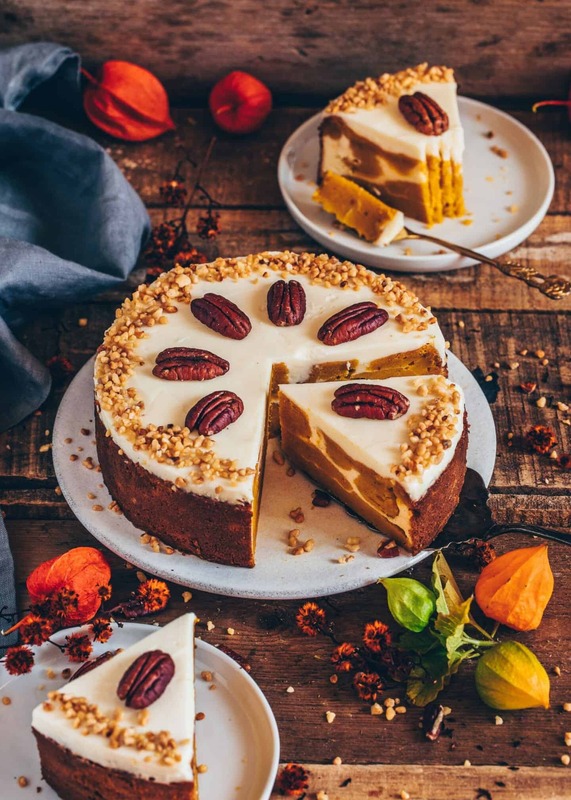 In one bowl, mix the ingredients for the cheesecake and in the other bowl mix the ingredients for the pumpkin cake. Layer the pumpkin batter and the cheesecake batter by a heaped spoonful into the springform pan. It does not have to look very pretty because it should look like a swirled marble cake. Using homemade Pumpkin Purée or canned! Feel free to use canned pumpkin purée for this recipe. Personally I love making it from scratch as it’s more flavorful, much cheaper and you can prepare enough to store or freeze a batch for other recipes and dishes. To make Pumpkin Purée, simply cut a pumpkin in half (or small cubes) and scoop out the seeds with a spoon. Then brush a baking sheet or baking dish with a little oil, spread the pumpkin pieces on it and bake at 355°F (180°C), until the flesh is soft. The baking time depends on the size of the pumpkin pieces (usually about 25-50 minutes). 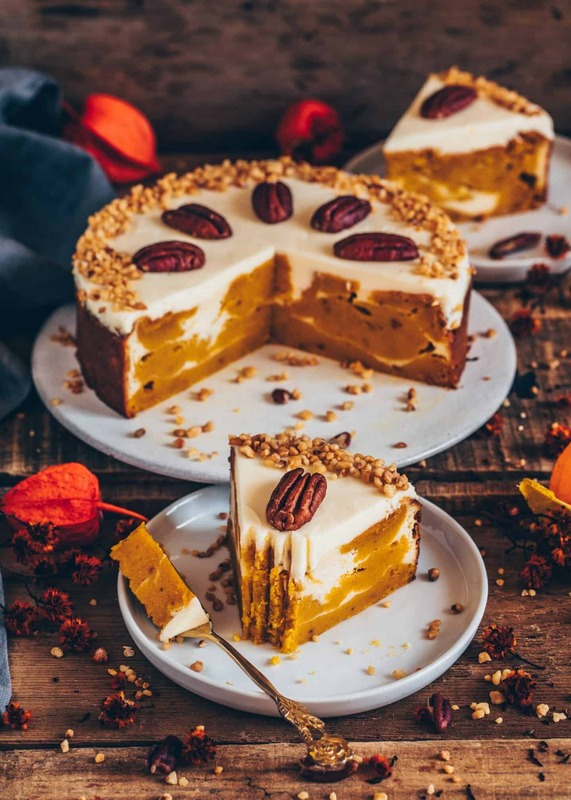 The perfect easy fall dessert and so versatile! 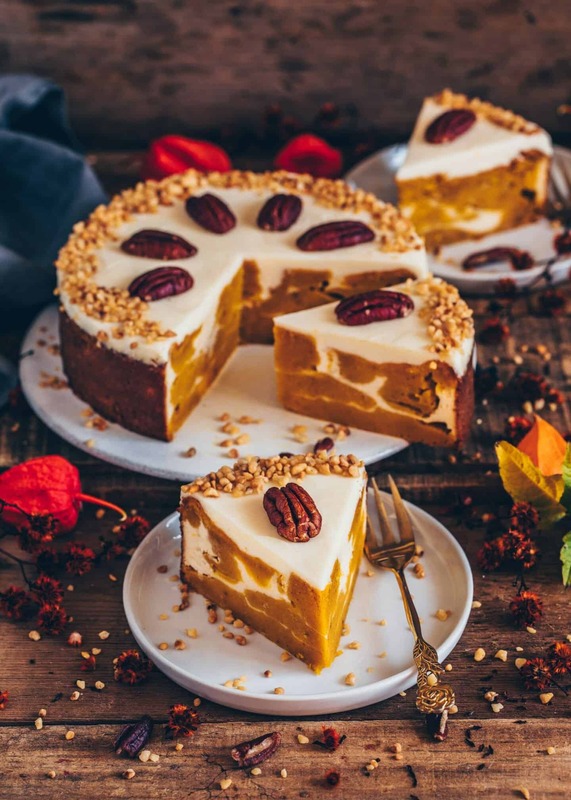 This cake is a great alternative to traditional pumpkin pie. I used a small 7-inch round baking tin but you could also bake this yummy cake in a bigger tin or brownie form or muffin forms. Please keep in mind that the baking time will be reduced then. You can simply test with a tooth pick if the cake is done. 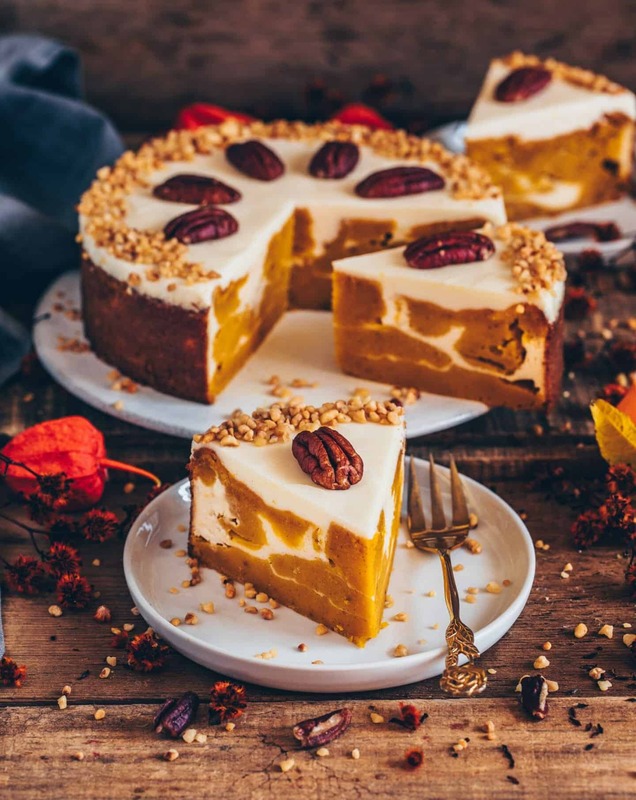 I also recommend you to bake it for family and friends and not just for yourself because everyone will get hungry when smelling all these delicious fall flavors in your house. 😃 Have fun trying and happy baking! Prepare the flax egg by stirring 1 tbsp ground flaxseeds in 3 tbsp of hot water. Allow to sit for a minute or so to become jelly. Add the pumpkin purée, flax egg, melted butter, sugar, vanilla and lemon juice to another mixing bowl and mix very well. Combine the flour with salt, baking powder, baking soda and sift into the pumpkin mixture. Sprinkle over ground almonds and the spices and mix until just combined using a whisk. Spread half of the pumpkin cake batter into a greased 7-inch round baking tin. Dollop half of the cheesecake mixture over the pumpkin batter. Top with remaining pumpkin batter, and dollop with remaining cheesecake mixture. Carefully, smooth out a bit. Bake for about 50 minutes. Afterwards, turn off the oven and let the cake in the oven for 10-20 minutes longer. Then, let cool completely. Blend all ingredients for the frosting using an electric hand mixer. 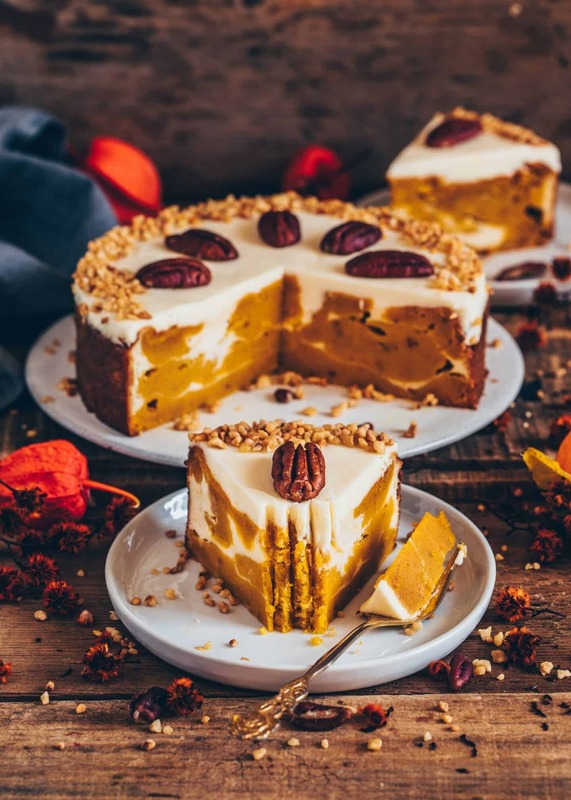 Spread frosting over cooled pumpkin cake. Place in the fridge to firm up for at least 1 hour before serving. 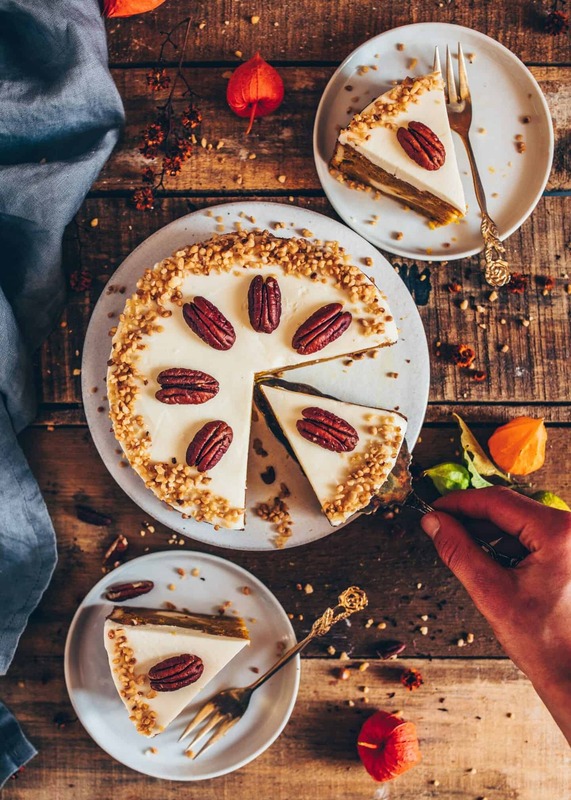 Decorate with chopped hazelnuts and pecans or other toppings you like. You can use canned pumpkin purée or make your own according this recipe. If your purée is a bit too wet then put it in a strainer so any excess water can run off. To make this cake sugar-free you can use brown erythritol and powdered erythritol instead of regular sugar. I used this vegan butter but margarine could work as well. Keep leftovers covered in the fridge where it will stay fresh and tasty for up to 4 days or freeze. Das klingt wirklich sehr leker liebe Bianca!! So glad that you like this cake so much. what kind of dairy-free cream cheese did you used? I used vegan cream cheese made of almonds. I bought it here in Germany. This was a delicious cake!! We really enjoyed it! Next time I’m going to double the cheesecake ingredients to make it extra creamy.